Did you know that some form of the toothbrush has been around for nearly 5,000 years? You might not even recognize these ancient brushes, as the bristles were made of unique materials such as hog’s hair, twigs and bamboo. The first modern-looking toothbrush was invented in 1948 in China. Over the average lifetime, this little invention gets a lot of attention from us. We spend about 38.5 days brushing our teeth! With this in mind, Dr. Pate and his team would like to share some tips with you, whether you’re choosing a new toothbrush or altering your brushing technique. Regardless of your preference for manual, powered, pink, or blue (the most popular color), the key is to choose a soft bristle brush that fits comfortably in all areas of your mouth. The ADA recommends disposing of your toothbrush every 3-4 months, or sooner if the bristles are worn. After all, your brush won’t clean your teeth properly with flattened or bent bristles. 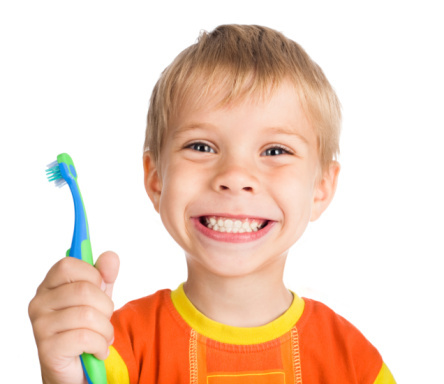 Children typically will need to replace their toothbrushes more frequently. Toothbrushes usually have about 2,000 bristles. For the best clean, hold the brush at a 45-degree angle towards the gum line while using short gentle strokes to cover each surface of the tooth. Dr. Pate suggests brushing for at least two minutes for an effective cleaning. Don’t forget your tongue! Giving it a scrub down will help to remove bacteria and freshen your breath. There has long been a vital connection between a healthy body and a healthy mouth. It’s a good idea to toss your toothbrush after a bacterial infection such as strep throat. Always allow your brush to air dry after each use, and keep it separate from other people’s toothbrushes. Whether you have natural teeth or dentures, bacteria likes to lurk in the mouth. NEVER use someone else’s toothbrush! Dr. Peter Pate and his team are always here to answer questions or offer tips for a healthy smile. To schedule your family’s dental cleanings, please call our Atlanta dentist office, Dentistry in Buckhead, at 404-226-9424.